Registration will open SOON for our 8th Annual Run Jack Run Family Fun Run/Walk to take place rain or shine on Thursday, July 4, 2019 in Falmouth! THANK YOU to all our 2019 RJR Logo Designers - Our winner (logo above) this year was RILEY COOPER, with 2nd place being NEVAEH PETERS and 3rd place being TOM CRANE. Congrats to you all! We hold RJR in Jack's honor, to raise awareness for drunk driving, and raise money for scholarships in his name awarded to Falmouth students who have signed Jack's PACT and are committed to their pledge not to drive while under the influence of alcohol or drugs. 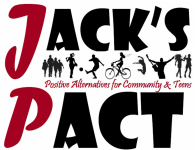 Over the past several years, we have been able to award over $50,000 to Falmouth students that are true role models thanks to so many wonderful donors, volunteers, runners, and walkers that make Run Jack Run such a huge success year after year! Thank you all!!! Check out our RJR Facebook Event Page for up to date information & share with your friends.